This mesh is coated with an oleophobic-hydrophobic material to separate oil and water. Credit: American Chemical Society. Oil and water don’t mix. That’s the old wisdom we’ve always been told. If it’s true, why are oil and water so difficult to separate? When oil spills occur, absorbents like clay, straw, or wool are added to sop up the oil. The problem is, it also sops up a lot of water. The absorbent needs to be gathered up and the oil recovered using costly, inefficient methods. 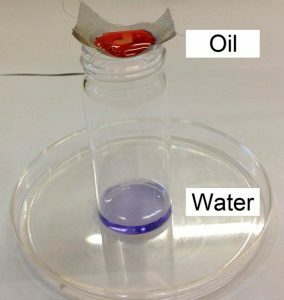 Researchers have been working on a new class of coatings called “oleophobic-hydrophobic” materials. These materials let water through but repel oil. Early tests showed these materials would take minutes to separate oil and water and not really do a good job at all. Chemists at Durham University have found a material that works faster and much better. They applied their coating to a metal screen and found the water ran through the mesh while the oil floated on top. Then to remove the oil, the screen was simply tipped to one side and poured into a collection tank. It also works much faster than previous films. Separation was achieved in seconds instead of minutes. They also demonstrated these coatings have excellent anti-fogging and self-cleaning properties. This research appears online at the American Chemical Society’s Applied Materials & Interfaces journal.